Ah, I suppose I should talk about Gamescom, before PAX arrives and swallows everything in my brain whole. Gamescom was the first big European computer game convention of the season, set in scenic Cologne. Previous years were set up in Liepzig, and though the facility was reportedly nice, the surrounding support network (hotels, restaurants) could not handle the size of the convention. And by size, I mean 245,000 attendees. Yeah, over a quarter of a million people, spread over four majors halls, each hall capable of swallowing GenCon whole and having room for Origins for desert. Add to that a "business hall" that was about two more GenCons in space, and you have a massive, massively multiperson convention. And the booths were huge. The old TSR castle would be considered quaint and tidy in this atmosphere. Aeon had a three story backpiece displaying a poster with media quotes, and it was neither the largest nor the most expensive of the booths. Blizzard erected a pair of huge monoliths to corral its faithful, while Bethesda erected a shanty town for its upcoming Brink, to which they restricted attendance so effectively that most people did not even know they were there. One challenge to conventions in Germany is the rating system, such that games that are non-E-for-Everybody cannot be shown to greater populace. Solutions tended to walled-off sections that created queues, which were great for showing that people were interested (Diablo III had ones supposedly lasting three hours), but hard for mobility elsewhere in the convention (both tying fans down with nothing to do while waiting and forming fandom clots in the otherwise broad halls). One PS3 provider managed to pull off both with a booth featuring inward-facing screens that could not be seen from outside, allowing people to publicly browse without worrying about showing the game outside the confines. NCSoft's booth consisted of a stage, a lot of terminals running the game, a bunch of huge screens, and was a great success. The terminals were continually slammed throughout the convention, and we had out own fans promoting the game by playing it. Every hour or so we would do a presentation for Aion (and for Guild Wars, debuting the trailer to the world). And it was packed. So much so we got a warning from the convention about clogging the halls. So packed we got a complaint from the Age of Conan folk about the noise. And mind you, they had a point here - the presentations were like soccer rallies, with call-and-respond cheers and a LOT of excitement. And when we made our presentation we were, just briefly, rock stars. This is a weird position for writers, artists, marketers and business folk. We spoke about the game, answered a few questions, and threw out T-shirts to a ravenous crowd. We even had pretty young women shouting at us in the front row. Like I said, Rock Stars. It was a nice moment. Cologne itself, a beautiful city dominated by its cathedral, was a great venue. While the hotel was dicey on the subject of elevators and connectivity, they did a great job hosting. In addition, our badges gave us a free pass on the rail system (Seattle please take note this for PAX). The food was excellent, though after three nights of excellent German food, we rebelled and ended up at an incredible asian/french fusion place in the shadow of the cathedral itself. All in all, we did what we intended to do - unleashed news of GW2 on the world, talked to a lot of press, and waved the flag for ArenaNet. And even now, I am still badly time-shifted, but I have to call it all a success. And next up - PAX. Well, apparently I am playing with a full deck now, at least as far as years are concerned. Long-time readers know that I try to spend my birthday away from the workflow - out of office, not checking emails, phone turned off, usually in some physically different space. I've hiked up Little Si and as far as one can up Rainier without requiring a back country pass, and flipped kayaks. Many, many kayaks. But with all the recent travel, I really didn't want to go anywhere, and slotting this particular birthday to putter around the house, read on the back deck, and take it easy. The piece is called "Anew" and was situated at Gasworks by the artist and her friends, who ninjaed it in one night and have chosen to leave it until the rains return or someone hauls it away. Originally, the park decided to haul it away on Thursday, but gave it a reprieve until Labor Day, but already people are starting to haul off pieces. The art itself is of several cocooned figures slowly emerging as golden humans (A very Sylvari sort of thing, for Guild Wars fans). It is brilliant and beautiful and perfectly located, and the park was filled with people seeking it out. Once started, we had to continue. The Lovely Bride and I headed to Magnusson Park and "The Fin Project: From Swords to Plowshares" at the base of Kite Hill (site of another piece of G-Art in 2001 when a monolith appeared). The Fin Project consists of a series of dorsal fins from nuclear subs, arranged to look like a pod of whales breaking the surface. Each fin is identified by both its original sub and the name of a whale from Puget Sound. A nice installation that fits smoothly into its environment. Then we set off looking for the "Sound Garden". Not the band, but the sculpture the band was named after. The Lovely Bride could not find it on an earlier trip, as it had been fenced off. The sculpture is on NOAA property, and in our after-11 world, security had sealed it away. Security is still there, and after explaining ourselves at the gatehouse, we provided ID and answered some questions and got directions. We found the structure, a series of weather vanes, each tied to a long hollow pipe, sadly quiet, though if this was from the gentleness of the day's breeze or its own age is unknown. Props to NOAA for making the art available again. And lastly the Olympic Sculpture Garden downtown. Compared to the other structures, this felt tamer and more mannered than the other locations, such that the land itself was restructured to accommodate the art. Everything was huge and monolithic but protected from the passersby by invisible watchers warning not to touch (as the Lovely Bride learned). However, there was nothing wrong with kids pulling all manner of chairs into the shade of the Calder Stabile, and they showed that you can interact with the art without provoking the wrath of the invisible watchers. One thing worth checking out in the park is the Vivarium, a long building housing a nurse log, with controlled temperatures and rainfall to study the effects of the decay of the log on the plants that spring up around it. The transplanting of the log and its surroundings into the center of Seattle is a telling commentary on our development fever. Joni Mitchell was spotted near the exit muttering something about a "tree museum". The day rounded up with a wonderful dinner at the Melrose in downtown Renton with John and Janice, and an early bedtime (I am still time-shifted beyond all belief). But it was nice to go on a sculpture tour of Seattle, and I suppose I will do it again, though probably not on my birthday. So the next few entries are going to come in no particular order, as I distill Pittsburgh and Cologne out all at once. But I wanted to mention this one up front. The Heinz History Center is located in downtown Pittsburgh, between the convention center and the Strip District (which, for those outside the Burgh, does not mean what you think it does - it is the strip of rail lines where the produce traditionally came into the city, sort of like Pike Place Market in Seattle, but with the Primanti Brothers instead of tossed fish). It is an extremely nice venue for local history, and has our old-fashioned trolleys, the Steelers' Super-Bowl Trophies, and Mr. Roger's cardigan. A real Pittsburgh institution, named after the late Senator John Heinz. Anyway, right now they are running an exhibit on Lincoln. The exhibit consists of two parts, a traveling exhibit about the man and the controversy around him (and if you liked Obama-as-Joker, you'll LOVER Lincoln-as-Lucifer), and a locally curated exhibit on the man with his stay in Pittsburgh (including the bed he slept in at the Monongahela House, the best hotel in Pgh at the time), and as well as local material published following his death, including funeral ribbons, commemoratives, and sheet music. That last one I want you to linger over. 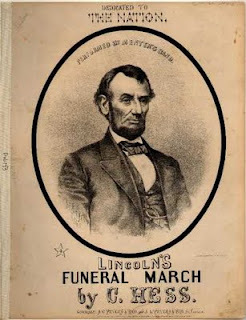 In one of the final displays, there is a piece of sheet music, the Lincoln Funeral March. Now in the days before MP3s and even before records, sheet music was the way music could get into the homes of everyday people. So there is this march, in the display case, and next to it is a small white card, which says the following: "A gift from Mr. and Mrs. John A. Grubb." Yes, this particular artifact was from my family. My mom's side of the family in particular, and belonged to my mom's mom. The History Center did a great job cleaning it up (the original was very sooty, not from any particular fire but from the general air of Pittsburgh, combined with age), and now it is immortalized (well, presented) in a museum. I've been away from the Home Office on Grubb Street for the past few weeks, first for the marriage of my eldest niece in Pittsburgh, and leaving there directly for Cologne, Germany and Gamescom. My presence in Germany was to help launch the initial trailer for the upcoming Guild Wars 2 game (said trailer can be found here. (Go ahead, go play it. I'll wait.It's really good). We launched about noon local time on Thursday, followed by about fifty bajillion hours of interviews which featured the game trailer and Uncle Jeff's Story Time, a great party, several great dinners, and a long flight back to Seattle, which allowed me to watch Frost/Nixon. 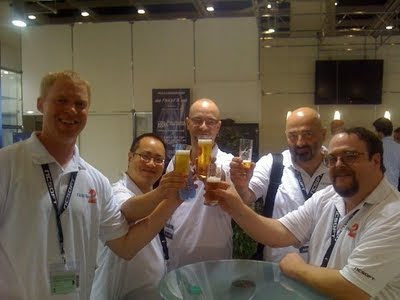 (L to R: Randy, Chris, Martin, Daniel, and your Humble Narrator. Note that Daniel and I started drinking before the toast). Horribly exhausted, but satisfied, both by the work and by the beer. More later. The King County executive race will play out pretty much as expected, with crypto-Republican Susan Hutchinson against Progressive Dem Dow Constantine. The problem Ms. Hutchinson faces is that while she was the lead vote-getter, while Constantine went up against a bunch of Dems and did pretty well. Position 9 on the King County Council will be incumbent Reagan Dunn against Beverly Tonda. The only thing that made me blink was that only 75% of the vote went to the well-known, well-financed incumbent. I mean, he was the only guy with yard signs. Perhaps one of those non-existent political parties in King County should get around to running a candidate and things would get REALLY interesting. Also lopsided was Anne Ellington's victory over Robert Kelly in the Court of Appeals, Div 1, Dist 1. Serves Mr. Kelly right for creating all those Sentinels to hunt the X-men. The Port will be Rob Holland versus David Doud for position 3, and Max Vekich versus Tom Albro at position 4. OK, that's good. You know you're going to hear more later on this one..
Kent School District is close enough to be considered up in the air. Tim Clark got 50% of the vote, and the remainder is evenly split between Dale Smith and Dave Watson. That will have to sort itself out. That's it for the locals. Over in Seattle, they decided that they LIKE plastic bags (someone should do an analysis to determine how much the American Chemical Association paid per vote in the end, and how that stimulated the local economy - and by "someone" I mean "not me"). Mayor of Seattle is also waiting for final ballots, and it seems that Incumbent Greg Nickels may actually not make it to big dance. Third terms are tough. Third terms when your street gets plowed and mine doesn't are even tougher. Just sayin'. The Ennie Awards were presented at GenCon on Friday, and several projects that I had a small contribution to took home the gold. Kobold Quarterly won for Best Writing, took the silver in the Best Aid or Accessory and Best Website categories. The Pathfinder Campaign Setting took the gold for Best Setting. I'm delighted by the outcomes and expect to get my slivers of the award in the very near future. Yeah, I've been away from the keyboard for a few days, but I just saw this note from my friends at Super Genius Games. A small shop I designed for them a while back for Call of Cthulhu is finally seeing the light of day, along with four others designed by some brilliant people. There was a surprising amount of feedback over my earlier post that there isn’t a lot of 4E at the Half-Price bookstore nearest Wizards of the Coast's offices down in Renton. A lot of people have reported in similar behavior at their local Half-Prices, but some have reported that 3 and 3.5 stuff were rare as well. So I went back this past weekend to check out the amount of 3 and 3.5. I found it there in sufficient numbers but also more picked over than previously. The stocks were depleted but not emptied, but I found 3 and 3.5 material, including core books, at the store. I also talked to one woman who was buying 3.5 core books, and had pulled a number off the shelves just before I got there. She was buying the books for her son, who wanted to play the game because her husband played it in the 80s. I told her about the existence of 3E and 3.5 and 4E, but she decided to go with 3.5, I think in part because it was there and because it had a lot that was closer to the game her husband played (I had the suddenly image of trying to explain 4E to someone who had broken in on the original hardbacks). The young woman ended up buying the three core books and a copy of the FR Campaign Setting. So, as far as the Half-Price books nearest the WotC corporate offices, there were no 4E books, a diminishing number of 3.5 and 3.0 books, and a good selection of older editions, going back to original Fiend Folios and Monster Manuals. But all of the D&D material combined was still outweighed by another group of books. White Wolf's World of Darkness. I’ll let others cogitate on why there are so many of those. LAKE GENEVA — Gary Gygax, co-creator of the fantasy game Dungeons & Dragons and father of the role-playing phenomenon, gave millions of men and women a gift: husbands, wives and lifelong friends. Gygax's wife, Gail, and his children want the local gaming giant to be remembered for his immeasurable contribution by erecting a memorial statue of him in his hometown. I think this is brilliant. I lived and worked in Lake Geneva for many years, both at TSR and freelance, and think that a Gygaxian statue would be a very good thing. Gamers have seen Lake Geneva as a Mecca, and aside from a slew of buildings in various states of repair and repurposed to other duties scattered around the town and recognizable only to those who were there at the time, there is nothing to speak of the man or his company. The place they are proposing the statue - Library Park, is a tree-shaded strip of land overlooking the northern bend of Geneva Lake itself. It is next to the public library, a lovely low structure that (if I remember right) was designed by one of Frank Lloyd Wright's students. There is a small and tasteful Veteran's memorial, but other than that, it is a sprawling lawn suitable for picnics in the summer, watching the ice houses in the winter. There is a second park along the lake in town as well, Flat Iron Park, a triangular (of course) wedge that is more open and used for carnivals (during the Venetian Festival) weddings, and other large events. This park already has a statue - to the comic strip character Andy Gump. Most Wisconsin towns have a civil war soldier, we get a character from the pages of the Chicago Tribune (Gump's creator lived in Lake Geneva). It has been one of the quirky things about Lake Geneva, and bodes well for the possibility for a statue to another talented native son. The addition of a Gygax statue would be a good thing for Lake Geneva, a good thing for gamers, and a good thing for the memory of the man who co-created the game and built the company that has given me (and a lot of other creatives) so much for so many years. Happy Birthday to the President of the United States, who was born on Krypton and bundled into a rocket ship by his father, Kryptonian national Jor-El, and sent to earth. What? I have the Kandorian birth certificate right here. Ignore the fact it is made with construction paper, glitter, and crayon. (And a Happy Birthday to author and fellow Allit Matt Forbeck and artist and friend Larry Elmore. Though come to think of it, I've never seen THEIR birth certificates either). Update The picture is from Mike Kelley's "Kandors" installation. I saw this when I was in Pittsburgh a couple years ago and thought it was a brilliant meshing of popular culture and modern art, but never had a chance to mention it until now. More photos here. We’ve got a primary coming up in King County in a few weeks, and most of you have received your mail-in ballots now. And behold that which the will of the people has wrought – a primary in August, non-partisan positions, reducing number of districts for King County Council. And the end result is not much to brag about. And as always I recommend you check out the Municipal League ratings (though to be honest, this year there are a couple strange outliers), and the endorsements of the Seattle Times and Stranger. Strap in kids, I’m going try to do this in one sitting. Let me concentrate on the stuff I can actually vote on; the big one is King County Executive. The former KCE Ron Sims is in the Obama administration now, so we need a replacement, and there has been a host of challengers. It boils down to who is going to compete with front-runner Susan Hutchinson, who is well known as a former local newscaster and less well known for supporting Republicans and conservative operations like Discovery Institute. She’s been trying to keep those connections out of the discussion since "this is a non-partisan position” and you know, you shouldn’t really, um, judge the person you vote for based on what the really believe, anyway. On the other hand, there are a number of excellent candidates in competition, including Ross Hunter and Fred Jarrett, but I am going to recommend Dow Constantine, the current King County Council Chair. We have five King County Council incumbents seeking re-election, but only have one of them that has primary competition for their offices (Hey, you guys voted for this situation, don’t look at me). Reagan Dunn is the incumbent in position 9, and should be noted on his yard-sign. He has "DUNN" in big blog letters (his mom was the long-serving US Rep from the 8th US House District) while the “Reagan” (a name that does not play well in some parts around here) is a spaghetti-thin script in dark green (against a red background, so it vibrates to unreadability). Back before we decided to non-partisan the position, Dunn was a Republican, but now we want to hide their party, their support, and sometimes their names. Sigh. At least he sees some competition – Perennial candidate Mark Greene (formerly of the Party of Commons, when parties still gave you a clue) and Beverly Tonda (who does not have a website, and according to the Weekly, is in the race in part due to frustrations over developing her land). I’m not a fan of hereditary political officers, but I got nothing here. At least you get a chance to vote “Throw the Bounders Out”, which is more than you get for the other districts. No Recommendation. Court of Appeals (Div 1, Dist 1) has Anne Ellington versus Robert Kelly. Ellington walks in with a lot of experience (she’s the incumbent), endorsements, and an Outstanding from the Muni League. Since there are only two candidates, the winner of this primary election gets the job (another recent wrinkle that irritates me). So vote for Anne Ellington. And then there is the Port of Seattle, our own local Mos Eisley, capable of producing all manner of shady deals and brewing scandals among pro-business corporate types. These pro-business corporate types then either get regularly re-elected despite the woes or retire (with lovely parting gifts) to be replaced by other corporate types. I’m going to go with Rob Holland for the 3rd and Max Vekich in the 4th. Both are strong union, strong reform types with experience on the docks. Lastly, on a pure local level, Kent School District 415, Director District 5 has three candidates and we have to whittle them down to two. Tim Clark, Dave Wilson, and Dale Smith have their only exposure through the voting guide. All three come off as intelligent people who have children/grandchildren who were in/are the Kent District, and all use the word diverse/diversity correctly in a sentence. I'm going to pitch for Tim Clark for the three readers of this blog who happen to LIVE in Kent, and primarily because of the nod he makes to the arts. And that’s it – I don’t get to vote for Mayor of Seattle (or rather – who gets to run against incumbent Mayor Greg Nickels) or the Referendum on charging a 20-cent fee for using plastic bags. I will note that the American Chemical Company has pumped $1.4 million into the campaign to defeat this, which works out to about $2.40 per person in the city, or the equivalent of 12 plastic bags. Wouldn’t it be simpler just to mail everyone in the city 12 plastic bags? Update: Shelly in Seattle has her recommendations from up in Kirkland. She and I don't agree on all points. Oh, the shock! Update Update: And the website Publicola weighs in. And I would be remiss to point out that today is the LAST day to vote on the ENnies, and that Kobold Quarterly is up for Best Writing AND Best Aid or Accessory AND Best Website. So if you're thinking about voting, your time is running out.